Renowned as a premier festival band for the past decade, Afro Dizzi Act demonstrate outrageous musicality and maturity on their fourth studio album, each track blending West African melodies and rich world textures with hearty black soul. A potent melting pot of cultural and musical ideology, ‘Peace Love and Unity’ sends a worldwide message that cultural differences need not be a source of conflict. “It’s a double album featuring both Afro Dizzi Act originals and dance floor-ready remixes, It’s really a fusion of African roots, jazz, funk, rock, hip-hop and electronic sounds and we can’t wait to take it direct to audiences on the festival circuit all summer long.” says the band’s bass guitarist O.J Newcombe. The first single from the album ‘Do You Love’ will be a standout summer tune, sure to have “audiences swaying and jumping to their funky grooves and catchy lyrics” (Nepali Times). The entrancing vocals of Jali Buba Kuyateh also give this album a memorable and distinctive sound. The story of Afro Dizzi Act’s collaboration with the brilliant Jali Buba Kuyateh is one of two paths merging organically. Meeting while rehearsing independently in the artist tent at 2004 Woodford Folk Festival, both Jali and Afro noticed the funky fusion created as their two sounds melded into one. Jali and the boys came together and on the very same night performed to 4000 people on the Big Top stage. Afro Dizzi Act have played at Park Life, Island Vibe, the Byron Bay Blues and Roots festival, Triple J’s Big Day Out, Livid fest and the legendary Woodford Folk Festival in Queensland six years running. 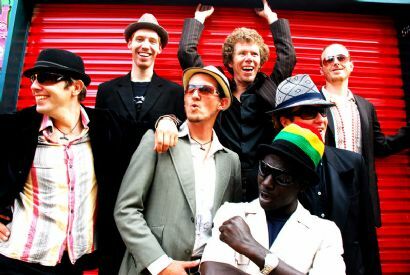 In addition to their home touring credits the boys have performed extensively throughout Asia, including live shows at the first two Kathmandu Jazz Festivals and Jazz Mahjalis in Dubai. These Brisbane Boys are sure to get the nation’s hips swiveling to the groove with their musical mantra: Peace Love & Unity. 'PEACE, LOVE & UNITY' ** FEATURE ALBUM ** ABC RADIO NATIONAL DAILY PLANET with Lucky Oceans. PEACE, LOVE & UNITY' # 9 ROOTS 'n' ALL TRIPLE J TOP 10 ROOTS ALBUMS of 2009. (as voted by JJJ Listeners) hosted by Sarah Howells. Afro Dizzi Act & their new album 'Peace Love & Unity' is pure epicness. Our kids have been dancing to it all week. “Afro's rhythmic jams have become the stuff of inner city legend.